If you are among the many that are now riding the “green wave” of being eco-friendly, then using reclaimed wood to decorate is a must! Creating sustainable designs inside your home will not only be a long-lasting addition to your home interior, it will catch the eye of friends and family. One room in your home that often gets looked over when it comes to decorating is the office. Although the home office is necessary, many get stumped on how to incorporate books, files, and office equipment in a pleasing manner like the rest of their home. Fret Not! With a few tweaks and some striking décor, the home office can become a beloved room in your home! 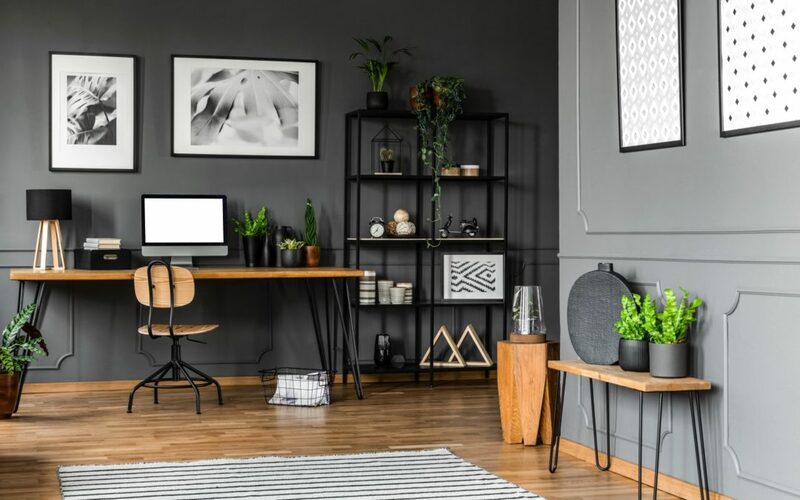 In this blog, we will go over a few home office design ideas that you can implement to give your office a rustic yet modern design! Whether your home office is large or small the addition of an accent wall can immediately boost the visual aesthetics. Since reclaimed wood is outstandingly beautiful and eye catching it can stand alone. Making an accent wall out of reclaimed wood can be a focal point for a new home office or be incorporated into existing décor without disturbing it! Reclaimed wood will bring natural texture from the outdoors in. Enhance the rustic beauty of your reclaimed wood by complimenting it with glass or polished stone! Remember! Every piece of reclaimed wood is unique and unmatchable. To reduce too much variation in your project, purchase what you need all at once. If you buy from one place within the same inventory the reclaimed wood is more likely to have come from the same structure. This means that it may have similar qualities in each piece. It is possible to create a beautiful desk that will have style and functionality. If you like the new industrial design trend, then combining pipes with reclaimed wood will give you an amazing finished product. Or if you like a more modern look adding smooth black legs will offset the rustic look of the reclaimed wood. If you are challenged for space, consider building an armoire out of reclaimed wood that has a pull -out desk. One of the most unattractive things about a home office is storage. There is nothing chic about filing cabinets and office equipment. By building shelves out of reclaimed wood, you can effectively store items, but with a touch of elegance. Shelving made of reclaimed wood can be placed on neighboring walls of an accent wall or on their own as a decorative piece. You can also build cabinetry with reclaimed wood to house printers, computer towers, and other unsightly items. By strategically designing your storage you can create a space-savvy strategy that will make your home office even more functional. Aside from these functional ideas you can warm up your home office with wall art made of reclaimed wood. Mirrors, clocks, candle holders, and planters are a great way to incorporate reclaimed wood into any design theme that you already have going! Here at Rocky Mountain Reclaimed, we proudly offer reclaimed wood with free shipping in the continental United States! If you’ve got questions regarding reclaimed wood, get in touch! We’d be happy to answer your questions!